How do you become a Hollywood Film Producer? Or a Second Assistant Director? Truth is, they’re not particularly straight-forward questions to answer. But that doesn’t mean you should give up there and start working in a jam factory as your school careers advisor recommended. 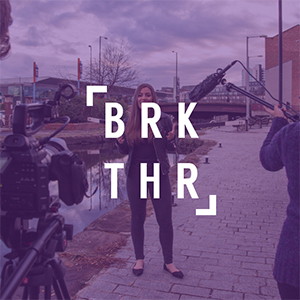 ‘Breakthrough’ is a project that sets out to answer the toughest of all career questions: ‘How do I get a job in film and television?’ Our YouTube channel will be offering loads of quality video uploads where we ask successful individuals to describe their journey to success and to outline any advice they’d give to those who are just setting out. We’re not just talking to actors and directors, we focus equally on people who hide behind-the-scenes; jobs like writers, editors, producers and camera operators are just as interesting and important. Think about it, how often do you get to hear from the Director of Photography or the Set Designer in a ‘making-of’ video? Never, right? Well, we want to get you access to them and everyone else. I’m Julia Belle, the project’s founder, and I came up with the idea just after I left university. Knowing I wanted a career in media, but clueless as to how to go about it, I was sitting with my mum watching a film and as the credits rolled up at the end I found myself fascinated by the list of hundreds of names. That’s when the idea of Breakthrough dawned on me: A YouTube channel where this information is free for everyone and anyone to access. I met James Copson, the director of Manchester-based film production agency, Anattic, through a mutual friend. I saw that his work was of an astounding quality, and that he had worked with clients such as Kellogg’s, Eon and The British Council. So I pitched the idea to him and as it turns out, I was in luck since he had only recently expressed an interest in searching for a passion project. Over the past year, James and I have built up a small and innovative team including two creative designers who go by the company name ‘Tucano’ - they handled our web design, graphics and photography. Additionally, we have a social media team and of course, a network of filmmakers to create our viewing content. Finally, last but not least, SUBSCRIBE to our channel, and we’ll help you BreakThrough. *Gaffer - Head electrician, responsible for the production’s lighting setup and rigging.